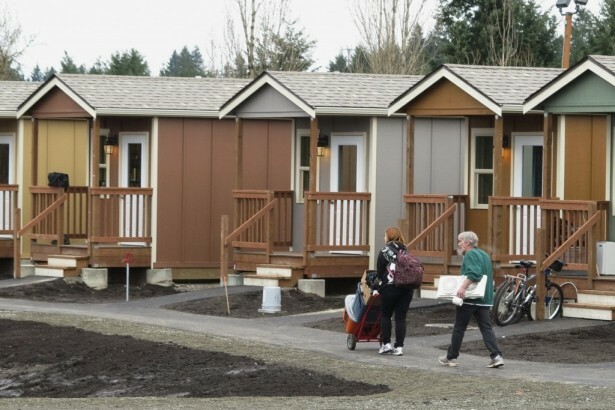 With the opening of Quixote Village, an innovative compound of 30 small cottages and a community center in Olympia, Wash., the six-year struggle of the homeless has finally paid off. In 2007 members of the homeless community in Olympia, Wash., erected a tent city in a downtown parking lot to protest the lack of services and support. Predictably, the city government responded with arrests and shutting down the encampment. That was supposed to be the end of it. Camp Quixote, though, did not disappear. Instead it embarked on a challenging, circuitous journey that at times must have seemed like some 21st century version of the mad misadventures of its visionary namesake, Don Quixote. Now, against all odds, this six-year pilgrimage has paid off, and Camp Quixote has become Quixote Village: an innovative compound of 30 small cottages and a community center. On December 24, the campers moved in — homeless no more. Nonviolent action is often dismissed as quixotic: utopian, dreamy, pursuing unreachable goals. But this example underscores how idealism is crucial to making real and practical change, though not always in the way one first imagines. The nonviolent resistance that the homeless women and men of Olympia organized did not change city officials’ minds, but it prompted allies in the community to come forward. A local church offered space for the encampment, and public support grew. The city was persuaded to pass an ordinance to allow the camp to exist, though with the stipulation that it would have to move every three months. Other churches stepped up, and over the past six years the encampment moved over 20 times. The vision of the Quixote campers from the beginning was to establish permanent housing, and within a few years the group worked with local allies to establish Panza — a nonprofit organization (named in honor of Don Quixote’s more sensible sidekick, Sancho Panza), whose mission would be to build Quixote Village. Even after land was acquired and a city permit was granted — and necessary funds were raised — business interests in the area went to court to try to stop the project. The court finally ruled in the village’s favor, the 30 houses were built and furnished, and now they are occupied and humming with life. Panza, the village landlord, is leasing the 2.17-acre site from the local county at $1 per year for 41 years. Village residents pay one-third of their income toward rent. Each cottage measures 150 square feet and includes a front porch, garden space and typical utilities. Two were designed to accommodate disabled residents. The community center has a kitchen, laundry facilities, showers, mailboxes and a common area. Bus service is nearby, and the local bus system has donated an eight-passenger van. Quixote Village may offer a model for other locales, so that such a project may not accommodate only 30 people but the millions of people without homes across the United States and beyond. This model has integrated what Gandhi called the obstructive program with the constructive program. Quixote Village highlights the critical role that nonviolent protest can play in mobilizing people power to challenge what is deemed impossible and to make the breakthroughs necessary for change. At the same time, it underscores the importance of literally building the alternative. This story is dear to my heart. As someone who grew up in Olympia, I am moved by the emergence of this project and how it carries on the local progressive work for justice — from Rachel Corrie, a local Evergreen College student who was killed nonviolently blockading a bulldozer that was demolishing a family’s home in Palestine in 2003 to the movement that organized blockades of arms shipments at the port a few years ago. Most personal of all is the fact that my brother Larry died on the streets of Olympia as a homeless person a dozen years ago. I vividly imagine Larry sitting on the porch of one of these new cottages, grinning from ear to ear, and then reaching for his snare drum and playing his music, the passion of his life. “These people have been to hell and back, and some of them several times,” Jill Severn, an ally who has been in this struggle since 2007, told the Seattle Times. Hi Ken, thanks for this chronicle of the journey from camp to village! I’ve been wanting to write a post on this project on my blog, Tent City Urbanism, but thought that this hit it spot on and wanted to ask permission to repost with credit.